Under the left front corner of the organ is the V303E power supply. Vox officially called this the Block 7300 Power Supply Unit. The purpose of the V303E power supply is to convert the local AC mains voltage to the small DC voltages required by the organ. The power transformer of the V303E power supply was preset at the factory for the local voltage of the locale where it was shipped. It had no external voltage selector apparatus. The V303 power supply provides two different voltages to operate the organ electronics. To this end, the power transformer has two secondaries, each rated at 12 volts, 5 amps. One of these two secondaries is connected to circuitry in the power supply that provides a tightly regulated -8.2VDC for operation of the tone generators. 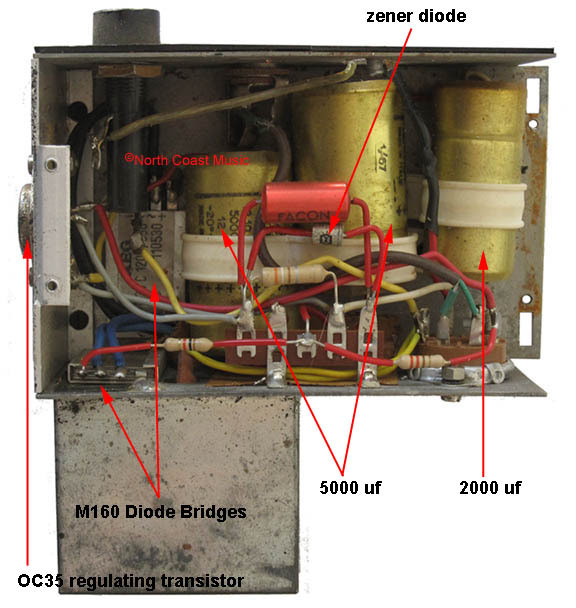 To accomplish this regulation, this leg of the power supply includes a traditional M160 diode bridge, several large filter capacitors, a zener diode, and an OC35 regulating transistor (as shown in Figure 3). The second secondary provides a non regulated +7.5 VDC to operate the bass divider circuitry. This leg of the power supply also employs an M160 diode bridge along with a 5000 uf 15v filter capacitor (also see Figure 3). The Vox Showroom and North Coast Music accepts no responsibility for personal injury or damage to property while using this information to attempt an organ repair. Proceed at your own risk. What malfunctions in the power supply unit? 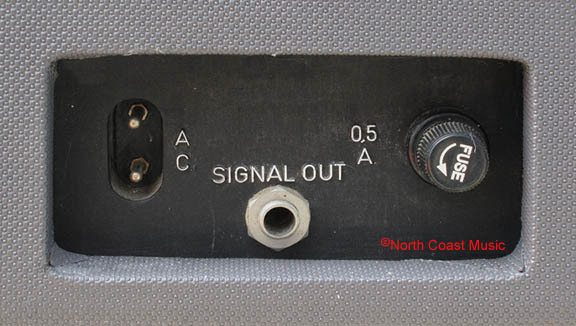 If the organ doesn't turn on when connected to local voltage and the switch in the "on" position, the problem could be as simple as a blown fuse. The fuse is located in the front panel of the power supply, next to the audio output jack (see Figure 4). If you find that the fuse blows again when you turn on the power switch, the problem is most likely in the power supply unit. Unfortunately, the power supply needs to be taken out of the organ to continue with the repair. This requires that the four nuts that fasten the power supply to the bottom of the organ must be removed. Next, unplug the octal plug that goes into the side of the power supply and then the power supply may be slipped out of the organ. It is very important to understand that potentially lethal voltages can be stored for weeks inside capacitors C1, C3, and C4. Unless you are knowledgeable in the precautions necessary working inside power supplies, you should stop here and refer the repair to a professional. I would suggest the following sequence of parts exchange. Filter capacitors C1, C3, and C4 can easily cause the fuse to blow or the organ to hum loudly and distort. If these parts are still original, they are at least 30 years past their life expectancy. If replacing these capacitors doesn't correct the problem, I would next replace the OC35 regulating transistor. 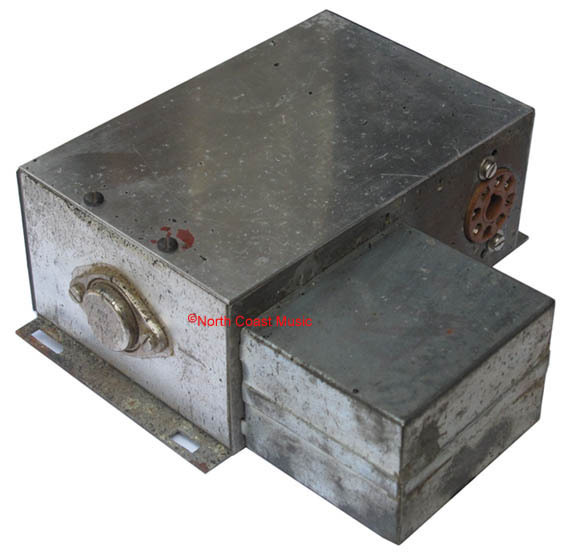 It is fastened to the case with two screws and requires a mica insulator between itself and the case of the power supply. If the power supply still blows a fuse, then one or both of the M160 diode bridges has probably failed. I am almost certain that the M160 is an obsolete part. An experienced electronics tech should be able to build a discrete diode bridge to replace the M160. You might wish to purchase the Vox V303 schematic to help you repair the power supply circuit. Parts values for all capacitors, resistors, and diodes are included in this schematic. 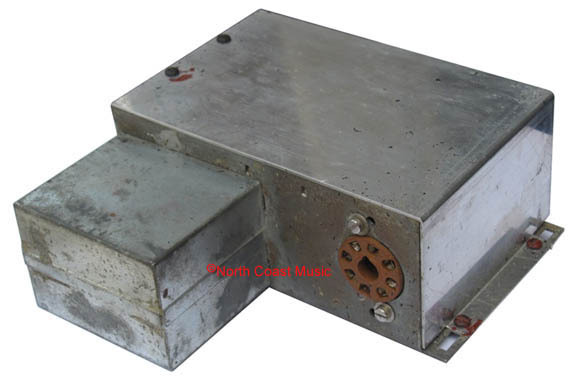 Click here to purchase this from North Coast Music.